Back in November I was assigned to cover the UWGB vs Wisconsin men’s college basketball game here at the Resch Center in Green Bay. This game has become a regular pre-season match up for the past few years, and has historically always been a close game between the two schools. This years game was no exception. The lead changed multiple times during the game which ultimately lead to the Badgers wining by only a margin of three points. UWGB’s Keifer Sykes had an opportunity to tie the game up in the last second but unfortunately the shot he put up didn’t go in. This matchup is always a great game to cover. Not only is there a good deal of action, but the atmosphere is electric. 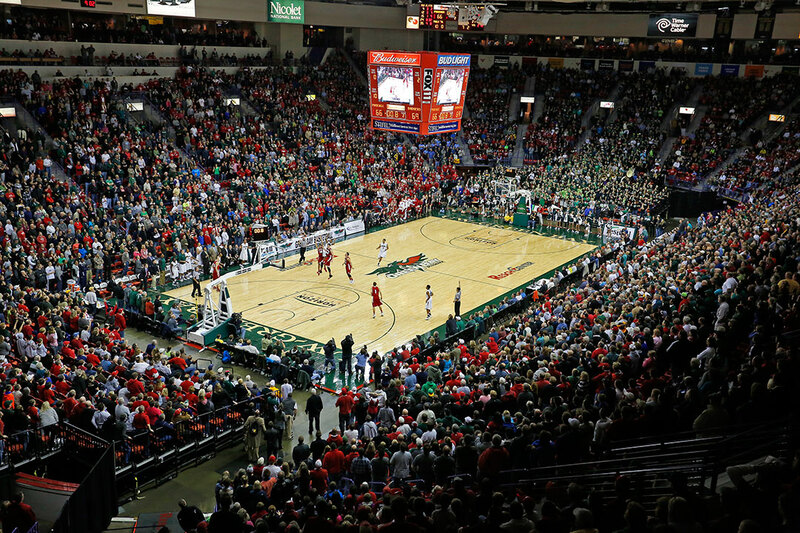 This year the game was a sell out, packing the Resch Center with the biggest crowd I have ever seen at a UWGB mens game. Since this game the Phoenix have been on a roll and are currently in first place in the Horizon League conference. As for the Badgers, they have fallen from third in the AP top 25 pole to currently not even being ranked in the pole. Still, there is a lot of basketball left to play this season and things can change quickly in only a matter of a few games. Here are my favorite shots from the game. Thanks for looking. P.S. I also shot a cool time lapse of the game for UWGB. You can find it at their web site by clicking the link below. Green Bay’s Keifer Sykes reacts in front of Wisconsin’s Frank Kaminsky after dunking on the first possession against Wisconsin. 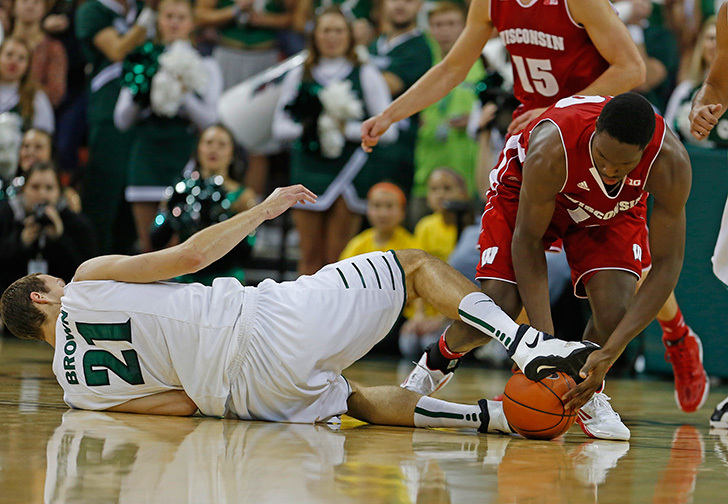 Wisconsin’s Nigel Hayes and Green Bay’s Alec Brown fight for a loose ball. 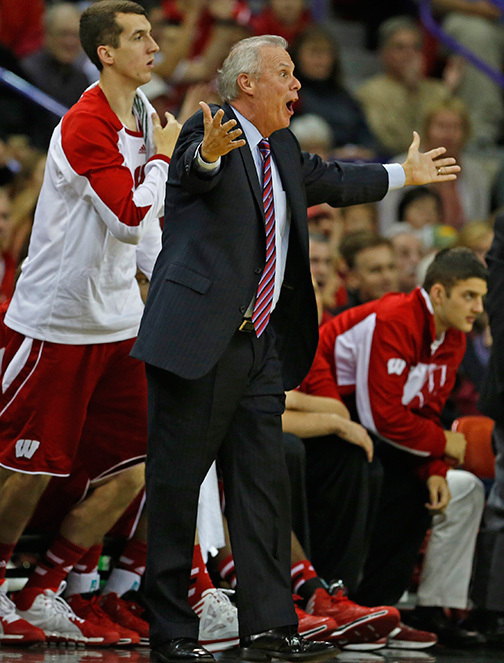 Wisconsin’s Wisconsin’s head coach Bo Ryan reacts to a foul call against the Badgers. Green Bay’s Keifer Sykes drives to the hoop while being guarded by Wisconsin’s Traevon Jackson (12) and Frank Kaminsky (44). Wisconsin’s Josh Gasser is fouled by Green Bay’s Kenneth Lowe. Wisconsin’s Ben Brust drives to the hoop past Green Bay’s Greg Mays (left) and Keifer Sykes. 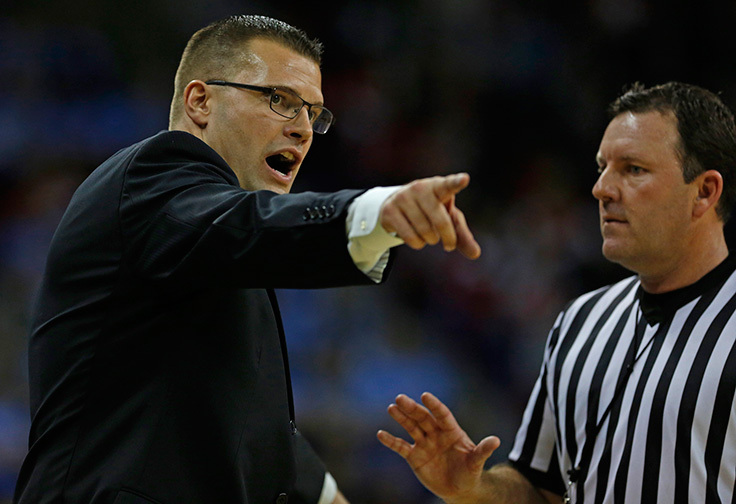 Green Bay’s head coach Brian Wardle argues a call with an official. Wisconsin’s Ben Brust shoots over Green Bay’s Jordan Fouse (4) and Carrington Love (12). 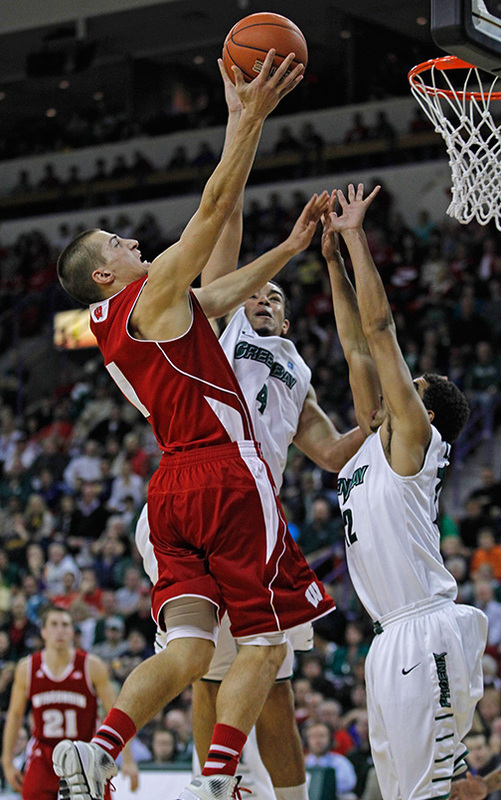 Wisconsin’s Frank Kaminsky posts up against Green Bay’s Alec Brown. Green Bay’s Keifer Sykes shoots a last second shot to try to tie the game while being guarded by Wisconsin’s Traevon Jackson (12) and Frank Kaminsky (44). Green Bay’s Keifer Sykes shoots a last second shot to try to tie the game in front of a sell out crowd at the Resch Center in Green Bay WI. This entry was posted in Uncategorized and tagged Alec Brown, Badgers, Basketball, Basketball photography, Ben Brust, Bo Ryan, Brian Wardle, canon 1d, canon 5d, Carrington Love, College Basketball, Frank Kaminsky, Green Bay, Greg Mays, Jordan Fouse, Josh Gasser, Keifer Sykes, Kenneth Lowe, NCAA Basketball, Nigel Hayes, Resch Center, Sports Photography, Time Lapse, Traevon Jackson, UWGB Phoenix, Wisconsin, Wisconsin Badgers on February 4, 2014 by ludtkephoto. Energy Button, transmitter gentle, and Turtle Beach brand. Just Andreas Salvesen : In studio soccer shoot. X-C Skiing Shoot With The Fujifilm X100s.